In my experience, some of the best and most memorable things about a day out are not those originally planned. That was certainly the case when I came across Ian Lawson‘s photographic exhibition at Rheged, Penrith, which has the title Herdwick: A Portrait of Lakeland. I had no expectations at all when I entered the white-walled exhibition area via the distinctive wooden and glass walkway on Rheged’s upper floor. I hadn’t seen any advertising about the exhibition, and was visiting Rheged to attend the Cumbria Life Home and Garden Show. The images that greeted me in the gallery are unforgettable, consisting of fabulous Lakeland scenes bathed in magical lighting and colour and taken at various times of year. 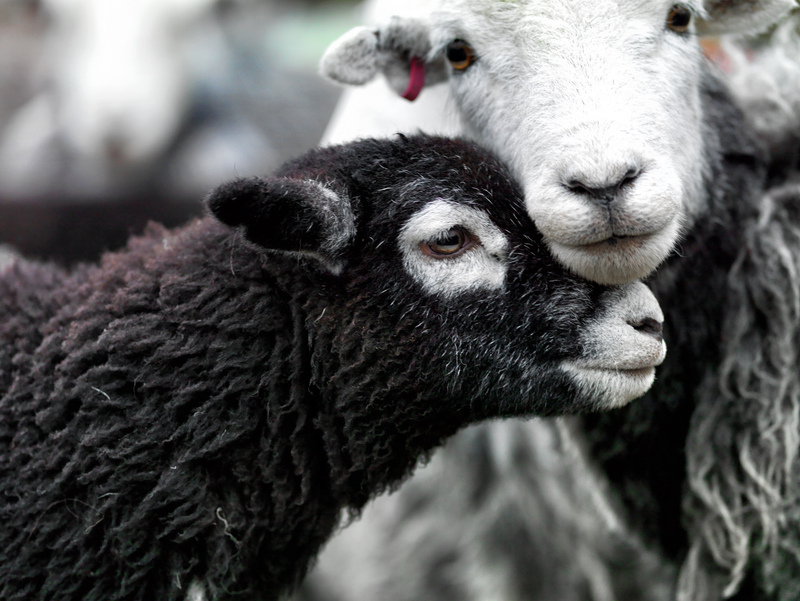 The stars of the show, of course, are the Herdwick sheep within these scenes, their distinctive and contented faces full of character and knowing. 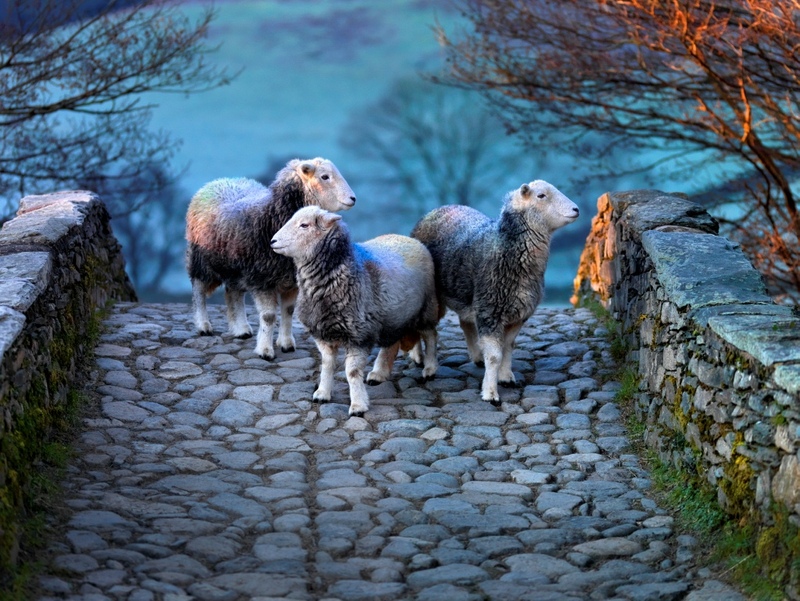 Some of the photographs are taken high up in the Lake District fells, whilst others feature the Herdwicks amongst cobbled walls and traditional Lakeland barns and cottages. I loved the pictures of sheep standing high on a ledge or rocky outcrop, surveying the beautiful scenes around them. It was so easy to get lost in each image, and the unique but harsh way of life they portray. Rheged’s own event listing describes the exhibition as ’emotional’, and while I write this I still find the experience very moving. Shortly after entering the gallery space, I turned around and was greeted with a panoramic image – one of several on display – which is around six feet in length, and captures the Lakeland landscape in an extraordinary orange light. A trademark of a number of Ian’s images is that they contain a fiery orange-red glow, sometimes in the sky and at other times reflecting on the fell tops. The amount of patience required to capture such perfect light must be phenomenal. In another of his panoramic scenes, there is a lake, a single building on the lake edge, and mountains all around, depicted in silhouettes ranging from grey to black. The only colour in this image is the vibrant green of a field running behind the lonesome dwelling, making a wonderful contrast. In my opinion the exhibition video above just doesn’t do the colours justice. 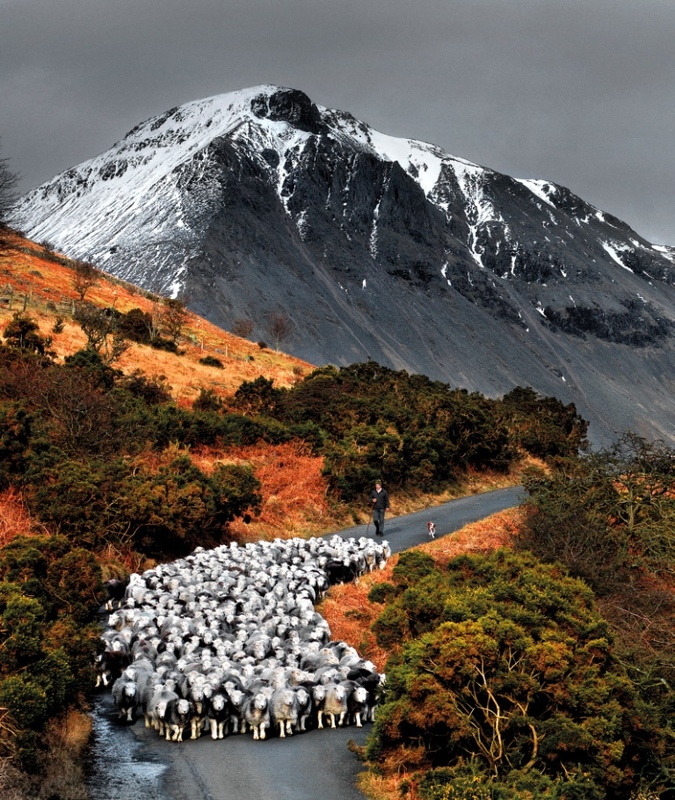 Ian’s exhibition is the result of five years spent observing Herdwick sheep and the farmers and shepherds who care for the landscape in which they live. He has produced an impressive 430 page book containing over 250 images, with a foreword by Prince Charles. The book is available to buy from the Gallery shop, with classic and special editions available (beautifully bound and presented, with a starting cost of £125). There is also a splendid Beatrix Potter Collector’s Edition, which has been limited to just 200 copies. You can see a generous sample preview from the book and its many wonderful photographs online. In addition to the photography, there were also a number of handmade wool exhibits on show in the gallery, made by members of The Wool Clip, a local group of artists who use Herdwick wool as a material in their work. One of my favourite examples is a sheep’s head made from felt (complete with horns, and mounted on the wall) by felt artist Debbie Lucas, based near Appleby. I also spent a long time admiring the elegantly shaped ‘Cobble Coat’, a three-quarter length woollen coat by Linda Chapman, and apparently inspired by Ian’s Packhorse Bridge image. This stands alongside a striking long ‘Gilded Tweed’ coat by Julia Neubauer (watch Ian’s promotional video above and you can just see them in a shot across the centre of the room). I don’t often rave about exhibitions, even though I’m an SLR user myself and have a personal interest in photography (like a true camera geek, the first thing I wanted to know was what the prints were mounted on). However, I would really recommend that you make time to see this particular collection of images. They can’t be enjoyed to their maximum on a computer screen, so I urge you to get to Rheged before the exhibition closes. The Herdwick: A Portrait of Lakeland exhibition is free to enter (I’ve paid a lot more to see an awful lot less!) and is on until 19 April 2015. For full details see Rheged’s online event listing. Ian’s work has just been featured on BBC1’s Countryfile, and is on show at Rheged until Sunday – if you haven’t already seen it, I would urge you to make time this week.